Spicely infuses their chocolates with lots of interesting-sounding combinations of teas & spices. 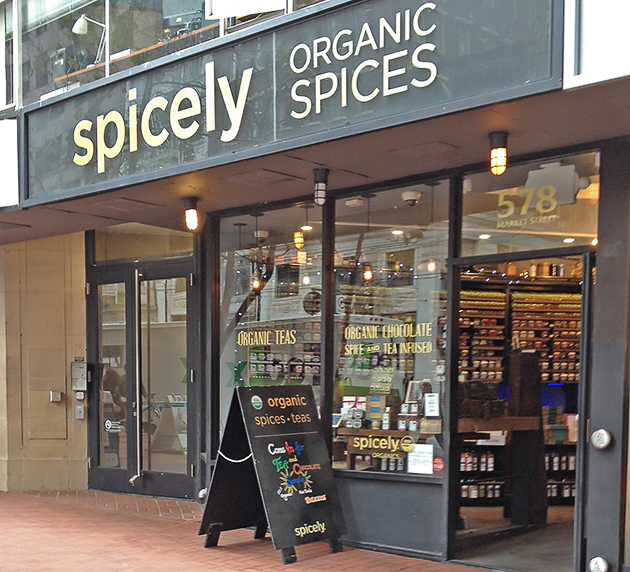 Spicely Organics’ teas, spices and chocolate are not only organic, they are non-GMO certified, fair trade certified, gluten-free certified, and kosher. Their chocolate discs are made in their Fremont factory from cacao beans sourced from Brazil, Ecuador and Peru, and infused with some of their 1000s of spices and teas. The 32 chocolate flavors range from subtle lavender-vanilla to warming Mayan Pepper Chai to the strangely addictive orange-rosemary. Most of the flavors are in 60% dark chocolate, with a couple of choices in 72%, a handful of milk chocolate choices, and one white chocolate (saffron). They are good either melted in hot milk or just melting on your tongue. If you can’t make it to their boutique on Market St., you can order online with free shipping. Bonus: The discs come in cute little windowed square tins that you can put to myriad other uses when the chocolates are gone. Don’t be intimidated by odd-sounding flavor combinations: You can sample as many flavors as you like at the boutique until you find one (or more) that you find appealing.